Former baseball umpire Jim Evans used to run an umpire’s school. One of his biggest lessons to his students was “an umpire’s biggest enemy is surprise.” That mantra can be adopted for all officials in all sports. As tongues were wagging at the end of the Seattle-Detroit game on Monday night, many were wondering how the official could miss an illegal bat (video). The reason the official missed the illegal bat was simple in my opinion — he was surprised. First of all, this wasn’t a regular swing-your-arm-and-hit-the-ball. The defender ran toward the ball and made sure the ball collided with his open hand — still an intentional act, but not overt. I’m sure the official asked himself “did I just see what I thought I saw?” If there is any doubt, officials are taught to keep the flag in their pocket — call what you know, not what you think. The play on Monday night, unfortunately, bit the back judge. So, how do officials defend against surprise? It starts with a good pre-game. Each week, the officials gather and go over mechanics, rules, film and situations. Many times officials will throw out “what if” scenarios. For instance, “On that play the foul happened before change of possession, but what would we have enforced if the foul happened after change of possession?” Or, “What if the Seattle player had been in the field of play and batted the ball out the back of the end zone? How would we have enforced a potential penalty?” Good referees always keep their crews on their toes by tossing out different scenarios and getting the crew focused on any eventuality. Still, after all of those safeguards are in place, sometimes something happens that an official has never seen or hasn’t seen since he officiated Pop Warner football 25 years ago. When that happens, it is important for the official to slow down, process what happened, and apply the proper rules. If he needs help, he needs to call over his partner closest to the play or even the referee and hash it out. Surprise is fun and interesting for players and fans — not so much for the officials. As the crews take to the field today, I’m sure they are heightened alert for the unusual. Photo: Walt Anderson’s crew make sure they are on the same page and are ready for any surprise. First sensible comment that I have read on this situation. When I first saw the video I thought OK this is odd but it wasn’t an overtly illegal bat. As someone who does most games as a BJ, I have to say that I agree with the original no-call. With replay and hindsight we may all agree that it was an illegal bat but in real-time I have to agree with the calling official here. It was not overt but it was definitely something that set alarm bells ringing in my head. As as R I would have to accept the judgement of the official best placed to see the incident and go with their judgement. If the BJ had flagged for an illegal bat then I would have gone with that decision as well. as an high school official myself many times plays have happened and I have thought “what just happened?” It might take a second or two to process what happened and to rule accordingly. Or ask for help from my other officials. Which is why I don’t understand why the field or side judge, who were also in the area to see the play, help the back judge out and discuss the bat. Nyall: Go back to Oct 6 and read my analysis of the botched bat. This is the problem with the current crop. They don’t run these scenarios in their mind and therefore they freeze when it happens. 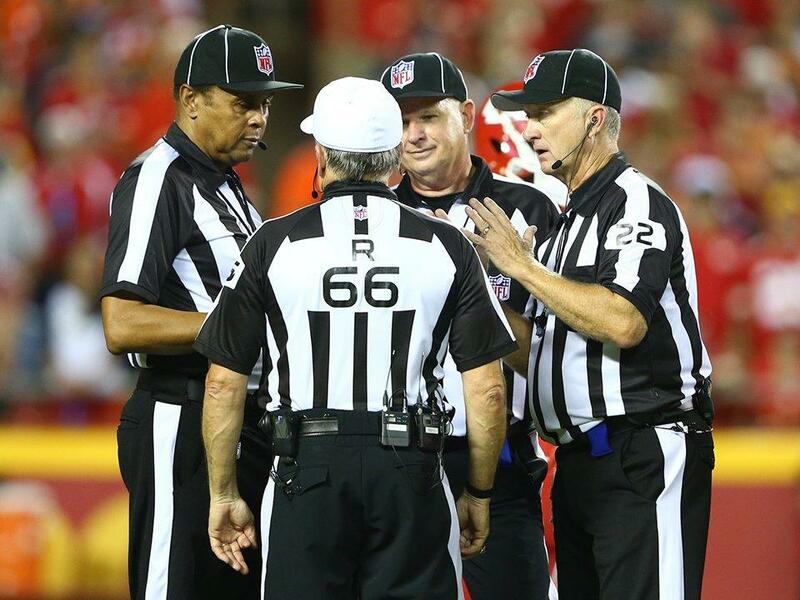 This is why the NFL needs to go with full time officials, who have no other profession to worry about other than this. Officiating and officiating correctly.